For inspiration I looked to the many challenge blogs around and discovered the All Sorts Challange Blog has a vintage themed week. When I think vintage I see lace, doilies, cloth flowers and muted colours. So here is my attempt at a Vintage themed card. 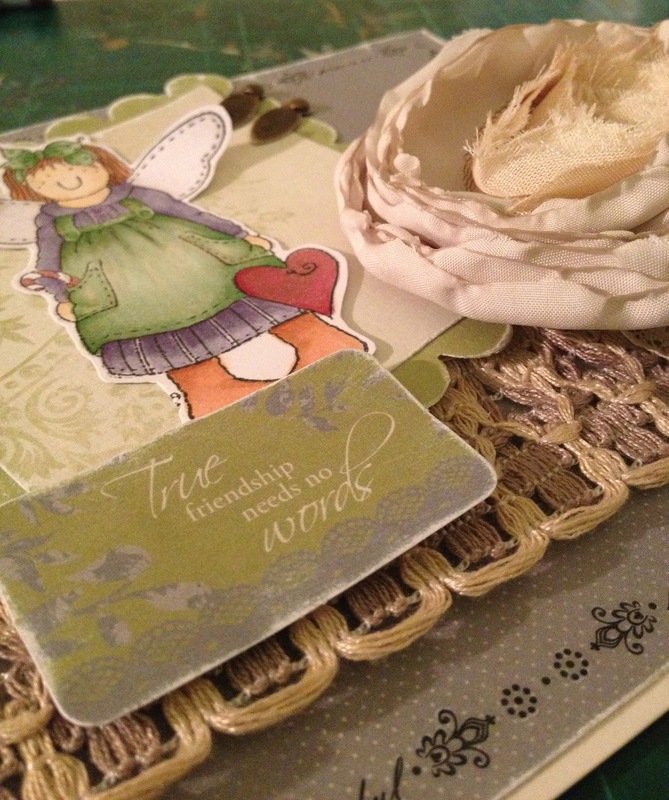 The papers are from the Kaiser Craft 6 1/2" Paper Pad Blae & Ivy. The Rub ons are from Kaiser Craft Pennyroyale Collection. The metal accents are from Printblocks. The lace is from my stash an probably purchased from an op-shop in Strathpine somewhere. 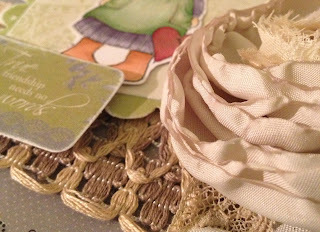 The gorgeous material flower is actually a brooch and from a cute little shop at the North Pine County Markets. 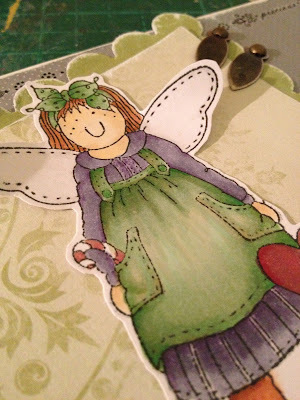 The stamp is from Molly Blooms and part of a their Christmas 2012 kit. Isn't she sweet. She is coloured with Copics. Considering I haven't used these in such a long time I am pretty happen with how this turned out. Just one more shot of that beautiful flower, I love that the material looks so much like delicate petals. I think I might have to make another trip to the markets for more of these! 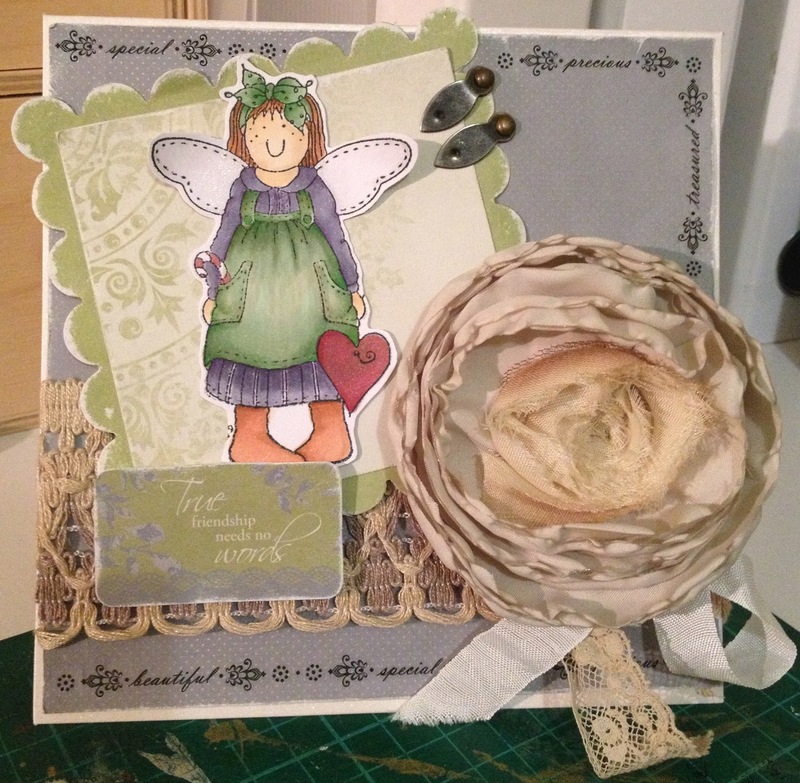 A super card Shell, thanks for sharing with us at Allsorts this week.